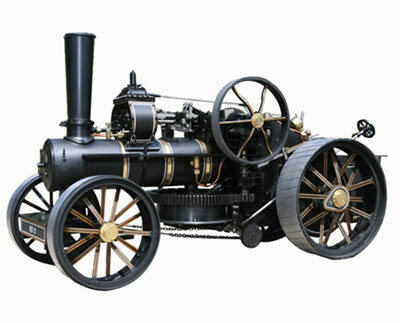 Fowler were the leading manufacturer of steam ploughing equipment from the 1870s onwards. In use there would be two engines, one either side of the field. The wire rope on the drum under one engine was wound out and attached to a double ended plough. The other engines rope was attached to the other end of the plough. The plough could then be pulled across the field by each engine in turn with the engine due to pull advancing slightly to align with the new furroughs as ploughing progressed. This method prevented the heavy engines from compacting the ploughed soil as they would with direct action ploughing. Other implements could be used instead of the plough, heavy duty cultivators and torpedo moles to harrow or land drain fields for example. One particular job which is still the reserve of the steam plough engine is dredging lakes and rivers, the great length of wire rope used in steam ploughing and the solid weight of the engine coupled with the unstallable torque of steam being ideal for this job. Our model represents the class BB1 engine. Many consider this to be the quintessential ploughing engine and with good reason for whilst the BB1 was not the absolute largest and most powerful traction engine that the world has seen (the larger Fowler Z7 and the German enlargements of the Fowler design competing with some of the rather weird monster American engines for those honours) it was certainly the largest traction engine commonly seen in Britain being the biggest ploughing engine that was ever used in any quantity and with a full service life. It comes as a twin cylinder compound, with two speed gearing and a coal fired boiler. There is a crankshaft driven boiler feed pump with bypass valve, and all the correct cable plough drum equipment with bevel gear drive and clutch, as per full size. Water and pressure gauges are provided along with lubricator, blower etc. At twice the size and thus around eight times the capacity of the 1" scale version it will make an extremely impressive and powerful model.